This dish has long been a favorite of mine, but was no where near paleo with lots of butter, cream, noodles, and other no nos! I’ve not only paleoized this classic dish and I must say the results were fantastic! I was a bit worried since my children reject anything with mushrooms or they pick them out. I think it is more the texture they don’t like than the taste. They did the same with this, but my oldest must be starting to grow up. I think he was hungry enough that he just toughened up and ate. After dinner he said “I ate like 6 mushrooms in one bite and I really didn’t taste them!” I’m guessing that’s good, or the desired result for him! I love the flavor and thought it was superb! I’m sure this would be super tasty over the traditional egg noodles, but those are out of the question for us… I’d love to have those again and just thinking about them does make my mouth water! However, as with most foods I think I crave, once I have them I realize they really aren’t as good as I had anticipated! I really love that about cleaning up our diets. That even though I have cravings for the old foods, once I cheat, I realize it wasn’t worth it, it wasn’t nearly as good as I remembered. I REALLY like the new stuff we are eating. It has such stronger and richer flavors! So if you’ve missed this recipe and really wanted a paleo version or at least gluten and dairy free; here you go! Enjoy! Heat wok or large pan over medium-high heat and saute sausage until no longer pink. Remove from the pan and place in a medium bowl and keep warm. Add mushrooms, onion and garlic to the pan and saute until onions are transparent and mushrooms are soft. Remove from pan and add to sausage. Add arrowroot to the broth in a separate bowl and whisk together. Melt about 1 TBSP lard in bottom of pan and add coconut flour. Cook for 2 minutes stirring constantly. Slowly add in the broth and arrowroot whisking constantly. Add sausage and veggie mix to wok with salt and pepper to taste. Reduce heat and simmer for 5 minutes. Remove from heat and stir in ½ can of full fat coconut milk. 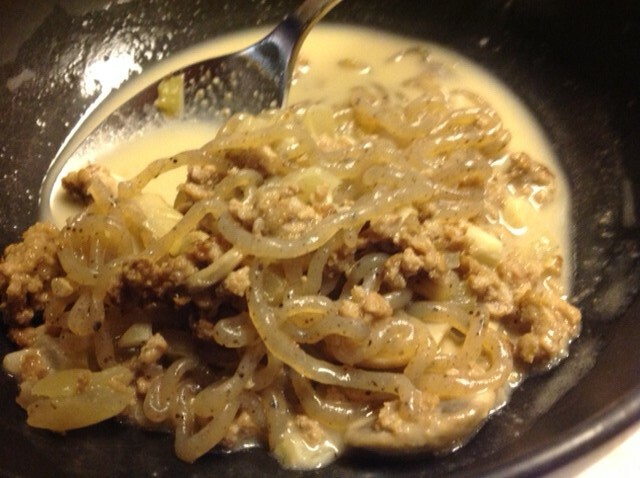 Serve over shirataki noodles, spaghetti squash or other veggie of your choice! This recipe fed our family of 5 eaters (3 of them under 7) with enough left over for Papa to take to work in the morning. I would have been happy with more leftovers, so I may increase the measurements next time! Also if you wanted to stretch a pound of meat for a larger family, I’m sure by adding more onions and mushrooms and 1 full can of coconut milk it would work well. I’ve also thought of adding some other veggies too like carrots, or cabbage or maybe pureed cauliflower. Kale would probably be good too. It wouldn’t be the traditional stroganoff anymore, but it would still be good! Enjoy and let me know how it turns out for you!